Last updated on February 9, 2019 By Nat Leave a Comment This post may contain affiliate links. We appreciate you supporting Rags To Niches! Full disclosure here. Listverse is a website I’ve been keen to check out for some time now….. Especially when I heard they paid $100 per list post published! This seemed like a decent amount, but was it true? Is Listverse legit? Can you really make $100 per article on this platform? In my Listverse review today, I will be covering the following…. How Do You Make Money On Listverse? How Much Money Can You Make & How Do They Pay? What Other People Think About Listverse Online. Other Ways To Make Money Writing Online. Listverse is a highly popular website that publishes…. you guessed it… list! 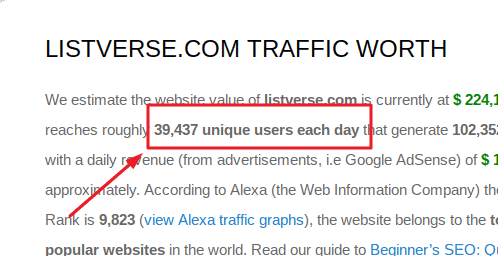 According to sitetrafficworth.com – Listverse generates over 39,000 people to their website every single day. They personally claim on their website to have 8 million readers and 30 million pageviews per month. Which just goes to demonstrate just how much we seem to love list posts about just about anything. They publish lists in various categories – such as; entertainment, lifestyle and even Bizarre. Their titles are always created to draw your attention, to click and share. They strongly rely on people sharing their content and the content is geared to be the sort that will do well on social media. What sort of posts do well on social media? yep – clickbait titles, short form content, videos and in particular, list posts about just about anything. So, Listverse have done well creating something that can really fly on social media and get tonnes of shares. But some won’t get very many shares at all and that’s just how it goes. They won’t always choose the right posts that are the most shareable, but it’s always going to be the aim. The more shares and pageviews a post has, the more potential Ad revenue they can receive. Want to make money writing in the long term? Check my out my free guide here. The good thing about Listverse is that, you don’t need any experience to write for them. However, you need to be aware that Listverse have changed their guidelines to ONLY accept native English speakers. If you’re not a native English speaker, your work will immediately be rejected. In order to get a post accepted on Listverse, you need to carefully follow their guidelines, (which are laid out on their website). To find out all you need to know, head to their, “submit a list,” section on their website – found here. You need to follow all the advice in their authors guide – which is pretty in depth! They seem to put particular emphasis on providing proof for any claims you make. It’s vital you submit sources to back up your claims, so that they can confirm they’re legitimate. However, they also have a whole bunch of sources that they claim are not reputable, so you really have to be careful where you’re getting your info from. I was impressed by how in depth the guide was they have for potential authors – it really covers absolutely everything you need to know. How Much Can You Money Can You Make On Listverse & How Are You Paid? You get paid $100 per article that is accepted. If you manage to get your list accepted, you will get $100 for your efforts and this will be paid via PayPal. Listverse explain in their author guide, that there is no limit to the amount of lists they will accept from you. But, that even their top writers rarely manage more than 1 per day. By this, they seem to be saying that SOME of their writers do manage 1 a day, which is $100 per day…..
My feeling is, once you have a list or two accepted, you will start to get a feeling for what they’re after. No similar list can have been published elsewhere on the web, nor on their own platform. So, if you want to write a post about interesting facts about jellybeans, (lol… I would read that) and you already find a list on that subject… think up something else! For fun, I looked it up and wouldn’t you know…. there are many posts about interesting facts about jellybeans! such as this one. However, as well as the info not being found elsewhere online, the content needs to match the style of content they already do. They state that they rarely will publish content on the latest technology, self-help, sports…. Or even animals! In their guide, they do give you plenty of advice to steer you in the right direction. They explain some of the lists that do really well and the ones they’re more likely to accept, if they are good enough. With the sheer amount of lists they already have on Listverse and the lists that already flood the internet on a daily basis… writing something unique sure won’t be easy. 10 times farts broke the law, (ha!). 10 terrible events behind your favorite movies. 10 crazy drugs that you could be growing in your garden. 10 lesser-known cases of people who tried to achieve immortality. What do you think, do you have some ideas in mind? What Do Other People Say About Listverse? Some people do feel that getting accepted is too difficult and that, if you want to get paid from Freelance writing, you should look elsewhere. I’d have to agree that, if you’re serious about writing online full-time, then you shouldn’t waste your time trying to relentlessly submit to Listverse or similar sites. With some dedication and effort, you can earn much more and with far less strict requirements. Interested in Freelance writing? Gina went from zero – $4000 per month in six months. Looking at a discussion on Quora, one person mentioned that they’d said they receive 150 submissions every single say and only publish 3 from that. That’s a huge number of rejections and writers that perhaps could be focusing their efforts elsewhere. In addition to the low acceptance rate, some writers have also complained about having multiple lists accepted, but waiting a long time to get paid. Actually, some have got pretty upset about their delay in payment. However, one of the people commenting updated the post to confirm that they had now been paid the full amount. So, while payment is delayed sometimes, it looks like you will get your payment eventually!! There isn’t a huge amount of people sharing their experiences good or bad, but I have seen their founder and editor reply to some queries online. It was good to see that they at least were trying to provide feedback and answer any concerns. Despite a few criticisms online, I believe that Listverse are still a legit company that do pay their writers – even if there has been some long delays. Do you have any experience writing for Listverse? I would love to hear about your experience below! Want a freebie to help with your writing? Here’s a list of 200+ writing niches & sub-niches that you could go into. In depth and helpful guidelines. Any native English speaker can submit a post. $100 per post, is a decent amount. You can promote yourself in your author blurb, (link to social media, other work, blog etc). A fairly long document of rules & regulations that you must follow. A large amount of websites that you cannot cite as your source. The same idea can’t have been posted before on Listverse, or anywhere else online. They may take weeks to let you know if you’re rejected or approved. They only publish 3 articles per day, (and there are 150+ daily submissions). They say they will pay you in 30 days of being approved, but some people claim they were not paid for months. Is Listverse Legit – Can You Make $100 Per Post? Yes, it’s possible that you can make money from creating a unique list post for this website. However, they say themselves that they are picky about the sort of lists they will accept. Your chances of getting a list accepted, is really on the slim side – but if you’re a new writer looking for experience, you may want to give it a go anyway! Even if you’re an established writer, if you find you have a knack for writing these lists; you could make a nice supplementary income from them. Furthermore, if your list is rejected from Listverse – there is no reason that it won’t be accepted on some other website instead. Bloggers are often on the look out for good content, (for example). So, if your list is rejected, you could research blogs within a relevant niche and send a pitch to them. The main concern about Listverse, is some people claim not to have been paid for them for months. While it seems writers get paid eventually – writers should never have to wait longer than necessary, when their work has been taken and published. I just…. thought that was interesting. So, while you’re constructing your unusual, astonishing and unique lists for Listverse….. Why stop there? 6 ways to make money writing product reviews. 10 legit ways to make money writing online. How to start up a money-making blog. I personally make the most money, from writing my own content – on my own website. That’s the thing about writing for other websites or blogs: they pay you once for your work. …They can continue to profit from your post years into the future – such as via ad revenue, or affiliate promotions. Earning a regular income from your own website is tonnes harder initially and you could be essentially be working for free for months. However, the long-term rewards are far more substantial and they’re something that can grow over time. I hope you found my Listverse review helpful… What do you think about this opportunity? Are you giving it a go? Let me know in the comments!